If you’re going to design a WordPress site, there are a few ways you can start. Many designers start with an HTML template that they then add WordPress code to. Others start with the basic WordPress code and design around that. But others begin with a starter theme or framework, which is arguably the most efficient way to create a WP theme. So you know you need a framework if you want to be more efficient in designing WP themes, but there are dozens of starter themes and frameworks out there. Where do you begin? The answer to that is with the list below. Check out the free and premium frameworks and starter themes below. 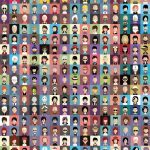 Try a few of them out and then decide which one(s) work best for your projects. Includes a number of design modes to get you started, including magazine and blog layouts, full-width layouts, and more. A layout builder with drag-and-drop functionality. Uses HTML5 and works with WordPress 3.0, including custom post types and menus, and custom taxonomies. Includes support for Google Fonts API and Cufon. Platform Pro is a great option for designers who want to quickly customize designs for their clients. Support for child themes makes it easy to create completely custom designs while maintaining the ease-of-use Platform Pro focuses on. There are tons of frameworks out there that make creating a WP theme quick and easy. As long as you don’t want to create a theme using Flash. That’s where SWFPress comes in. It uses XML to send your WP data to a Flash theme, making it easy to use a pre-existing theme or to build one from scratch. The advantages to using a framework like this are pretty obvious: you can use WP to update your site, and could use an alternate mobile site that doesn’t use Flash without too much trouble. Theme settings including color pickers, drop-down menus, form and table uploads, and more. The ability to format your XML files however you want. Works like any other theme, and can be fully customized by developers. While SWFPress isn’t going to be suitable for every website, it can make it easier to create Flash-based sites that are still easy to use and maintain. While Flash is definitely under a huge threat from HTML5, that doesn’t mean it’s going to go away completely any time soon. 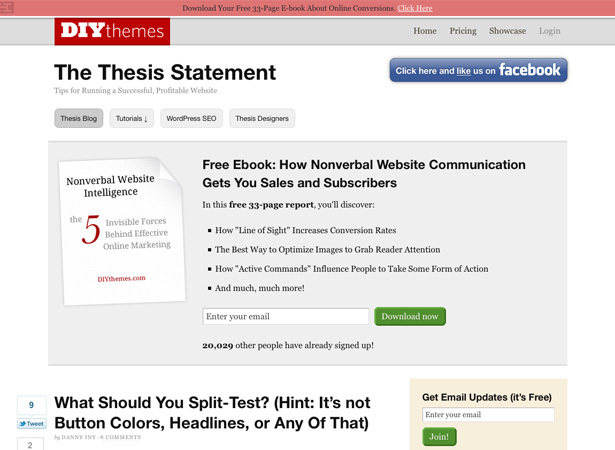 Thesis is one of the most popular premium theme frameworks, used on over 37,000 websites. 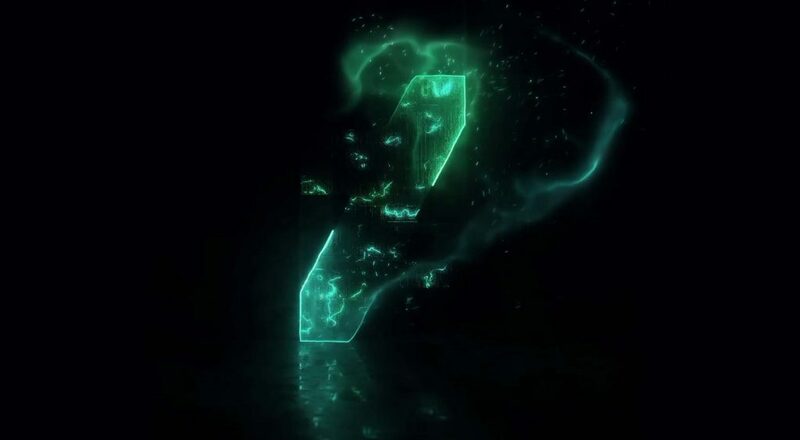 There are two licenses, with the less expensive one only allowing use on a single website (the developer license can be used on an unlimited number of your own sites, with additional license fees for use on client websites). Layout generator with 1, 2, and 3 column design options. 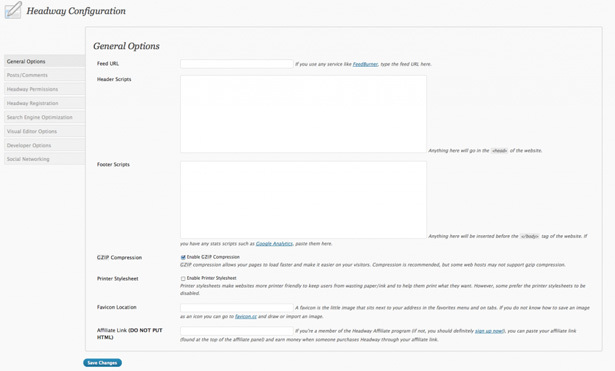 A full options panel for customization with coding. Thesis is a very highly-regarded theme framework, and is used on some high-profile sites like the Print Magazine blog, The Domino Project, and Outspoken Media. There’s a full gallery of Thesis customizations you can browse to get an idea of just what Thesis is capable of. Elemental is a premium framework that can be used as-is by bloggers or can be fully customized to build client sites for almost any purpose in a variety of styles. The main thing that sets it apart is that it looks good even without a child theme, making it a great choice for non-designers who want a customizable, but good-looking site. Control panel that lets you customize column size, typography, and navigation, among other things. Custom controls for masthead image and logo. Twelve custom page templates for things like contact forms, sitemaps, blogrolls, image galleries, and more. Custom widgets for social networking, Twitter updates, related posts, popular posts, and more. 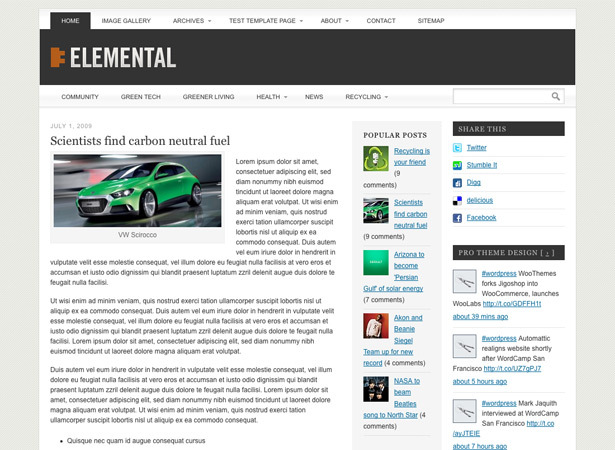 Elemental is a powerful premium theme that’s well-suited to developers and site owners. 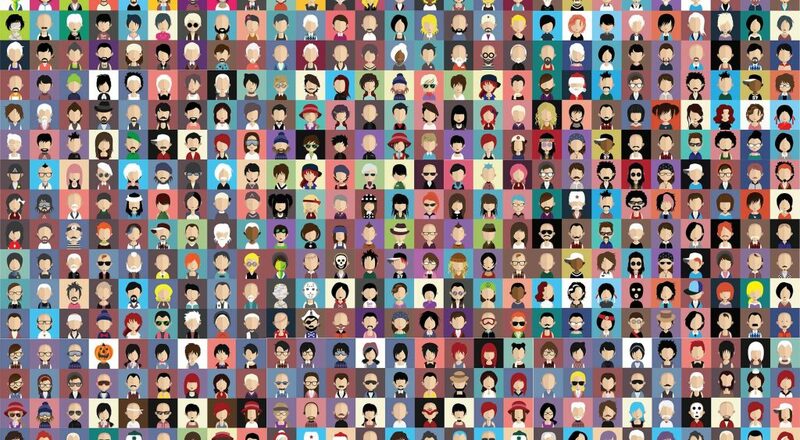 With all the customization options it offers, it can be used right out of the box without requiring child themes or custom coding, something many frameworks are lacking. 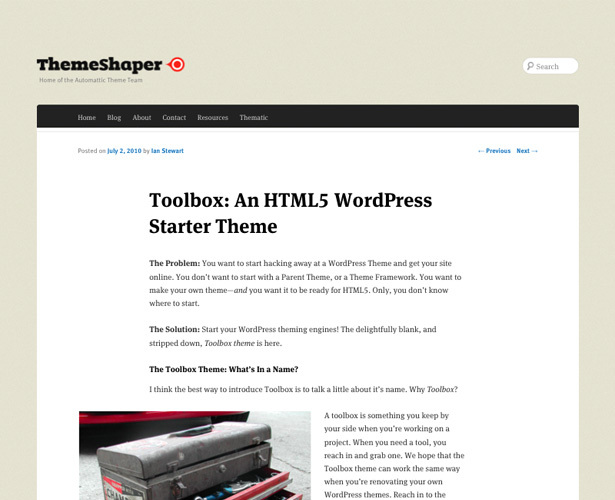 Toolbox is a free HTML5 starter theme that’s completely stripped down and ready for you to build from. It’s licensed to be used for commercial projects or publicly-released themes. It uses semantic HTML5 markup, is extremely minimal, and uses a fluid, em-based CSS layout that can also work for a static design. Suitable for fluid or fixed layouts. Free for personal or commercial use, and public themes. Toolbox isn’t loaded with tons of features, because its goal is to just give you a starting point for your theme designs. The flexible licensing is a huge plus for designers who want to create commercial themes without paying fees. 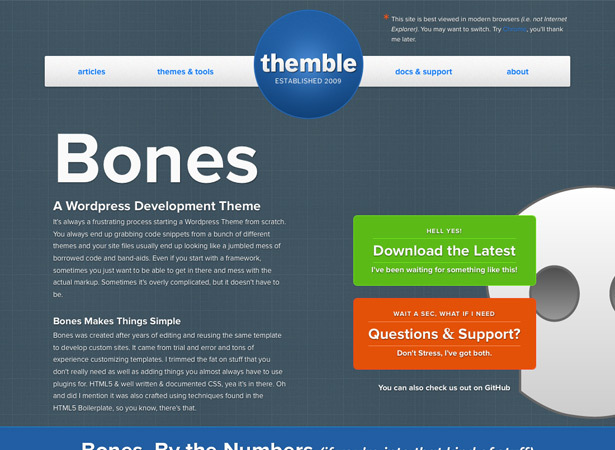 Bones is a WP development theme based on HTML5 Boilerplate, the 960.gs Grid, and CSS3. It includes two style sheets (one as a default and one for customization), and is only 246 KB in size. It includes five plugin-like functions to make your life easier, including relates post and page navigation. You can browse all of the code right on the website. Based on leading frameworks like HTML5 Boilerplate and 960.gs Grid. Built-in functions for features usually handled by plugins. Includes post type and post format features. Bones is a fantastic modern framework for designers looking to create HTML5 themes. It’s free and open source, and you can join in on the development on Github. 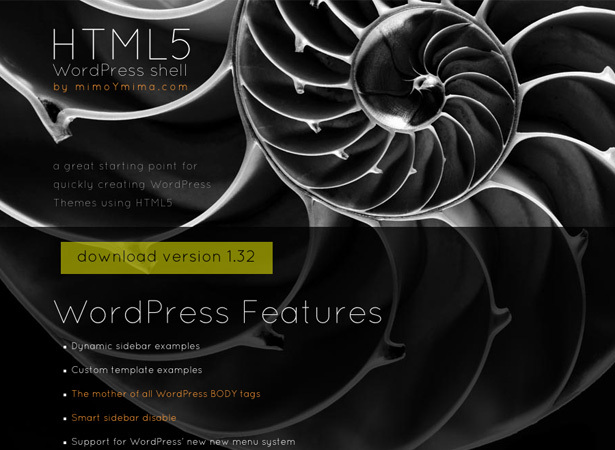 HTML5 WordPress Shell is designed to be a starting point for creating HTML5-based WP themes. It includes a number of WordPress features, as well as a number of HTML5 features and a separate set of base plugins they recommend you download and install. The code is all clearly commented to make it easier for you to customize and build from. Dynamic sidebar and custom template examples are included. Modernizr for HTML5 feature detection. Shell is a great starting-point with some useful features that aren’t found in many starter themes. The inclusion of base plugins (which you can download in one package) is a nice addition to the basic theme. Genesis is a premium theme from StudioPress. It makes it easy to quickly build custom WP sites, whether you’re a novice or an advanced developer. There are forty turn-key designs available for Genesis, or you can use it as the basis for building child themes. 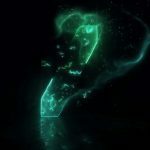 Unlimited support, updates, and websites. Integrated, single-click updates to both Genesis and WordPress that are fully tested and supported. Theme options include font size and choice, default layout, custom fields, header settings, navigation settings, and much more. Genesis is another framework that’s well-suited to both developers and designers as well as end-users. The number of child themes available makes it an affordable option for those who don’t want a completely custom design. WTF is an inexpensive premium framework that includes a highly-customizable options page, premium theme functions, and more. 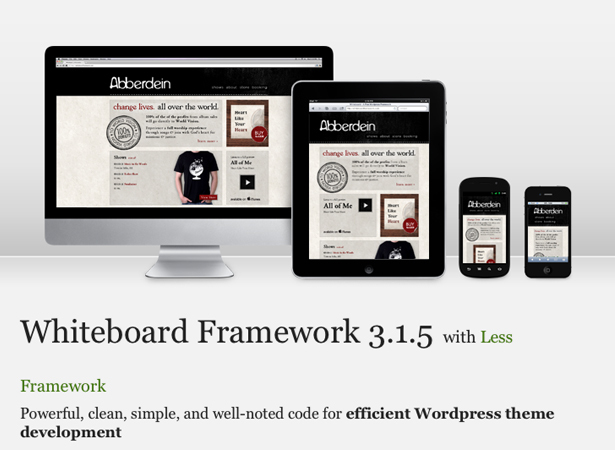 It’s one of the least expensive premium frameworks out there, available exclusively through CodeCanyon. It’s built to be used with any theme design to extend functionality and add theme options, and all you have to do to use it is put the folder into your theme folder and add a line of code to your functions.php file. Includes a number of additional post functions, including popular posts, related posts, and future posts. WTF works differently than most frameworks, but that makes it appealing to designers or users who already have a theme, but want to add more functionality and integrate a theme options panel into the existing design. 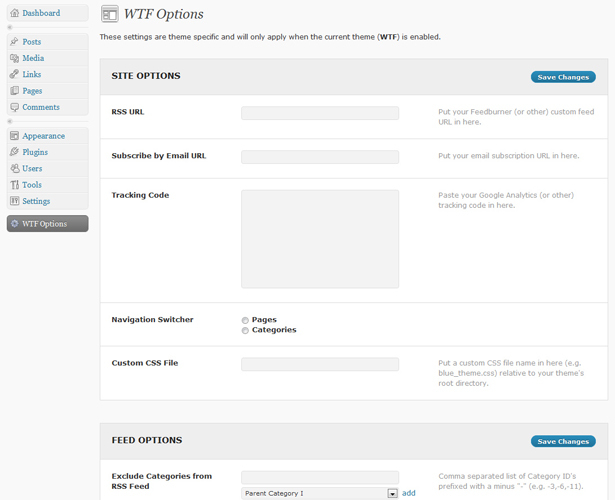 Thematic is one of the more well-known free WP frameworks, created by the Automattic Theme Team. It’s free and open-source, search-engine optimized, and highly-customizable and extensible. There’s a complete guide to using Thematic available on the ThemeShaper website, as well as a number of child themes. Includes a sample child theme for rapid development. Can by used as-is or as the basis for a child theme. Multiple layout options for 2 and 3 column designs. Editable footer text (the theme credit can be removed without damaging the rest of the theme’s code). 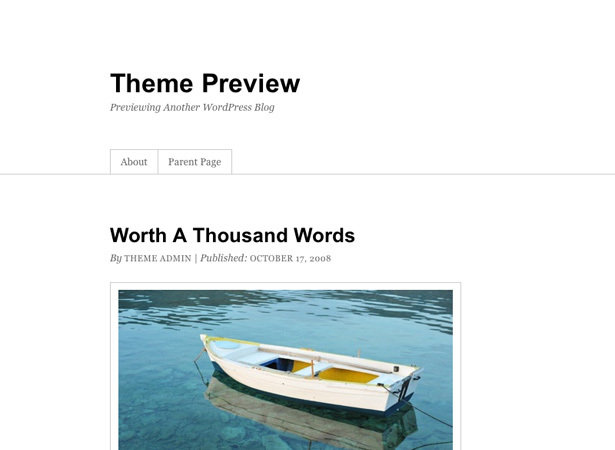 Thematic is one of the most highly-regarded theme frameworks out there. It’s also one of the most powerful, and may be overkill for some sites. The user guide makes it easy to get started, though, and even includes a style guide. 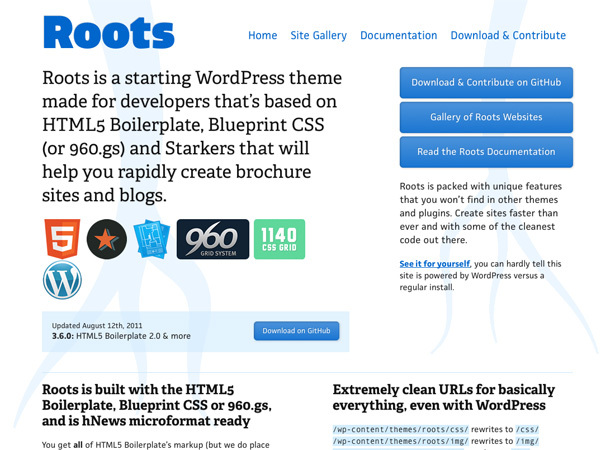 Roots is a basic HTML5 starter theme for developers. 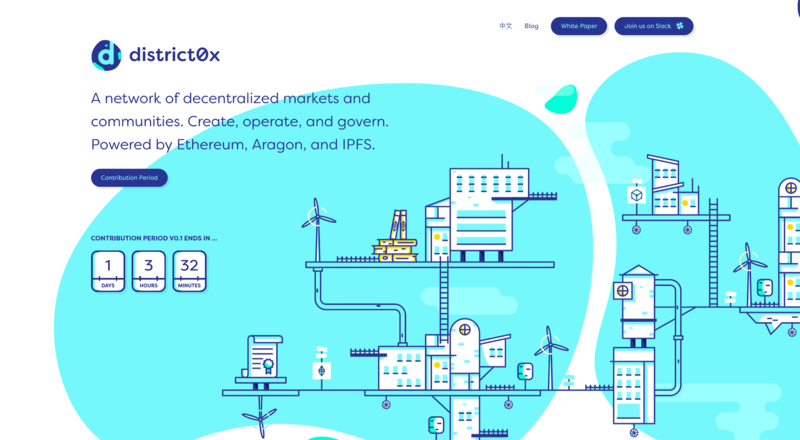 It offers the choice between using a number of layout frameworks as the base for the theme layout (including 960.gs, Blueprint CSS, and 1140 CSS Grid). It’s highly customizable, allowing you to create themes with virtually any layout or style you want. Rewrites URLs so they’re clean and free of the usual WP file structure. When activated from a fresh install, you’ll get a number of features upon activation, including a custom home page and permalink structure changes. Roots is one of the most promising HTML5 starter themes out there, and is highly customizable. 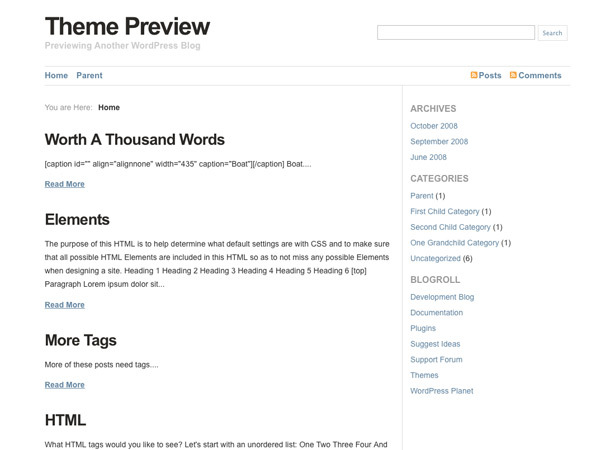 Basic built-in styles makes theme development quick and painless. 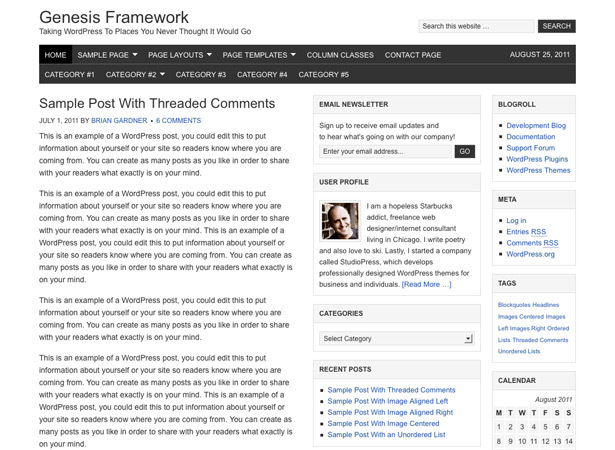 Headway Themes is a drag-and-drop WP framework licensed under the GNU GPLv2 license. It allows for visual design of your site, with a fully customizable look and layout. The Visual Layout Editor can save you time even if you’re comfortable working with HTML, CSS, and PHP. Headway Configuration Panel makes it easy to customize just about everything. The “Easy Hooks” feature makes it simple to insert custom content where you want on a page. Headway Themes includes a ton of features for both developers and designers, and can be customized even without coding knowledge. While it’s definitely among the more expensive premium frameworks out there, it’s also among the most fully-featured and user-friendly. Whiteboard is built on the Less Framework, meaning it adapts well to different screen sizes and formats. 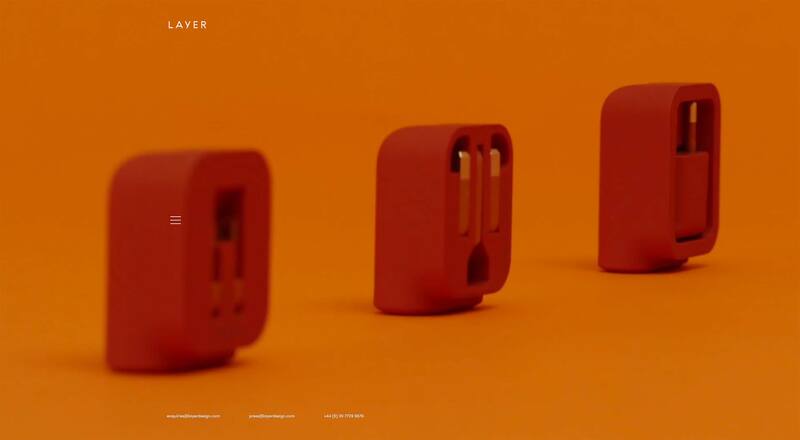 It has a minimalist design right out of the box, and can be used as-is or as the basis for a more complex theme design. It’s a great basis for virtually any kind of WP site. Built on the Less Framework so it includes a mobile version automatically. Can be used as-is or built on. HTML5 with graceful degradation built in. More dynamic classes and IDs than any other WP framework. Lightweight and well commented for easier development. Follows the Web Accessibility Initiative. Whiteboard is a highly-customizable theme, and its built-in basic styles and classes make it much quicker to develop themes. The overall div structure is strong and flexible, and the Less Framework can be easily removed if desired. Whiteboard is aimed at designers and developers who are comfortable working with HTML and CSS, unlike some of the other themes included here. Starkers is a semantic, bare-bones WordPress starter theme. It includes no styles, no presentational elements, and no non-semantic markup. It’s simply a blank slate for your theme designs, and is a stripped-back version of the default “Twenty Ten” theme. It’s fully-GPL licensed so you can use it for personal or commercial projects. Completely bare-bones with no presentational elements. Based on the Twenty Ten theme. Starkers is an excellent starting point for theme developers who want to create a modern theme basically from scratch. 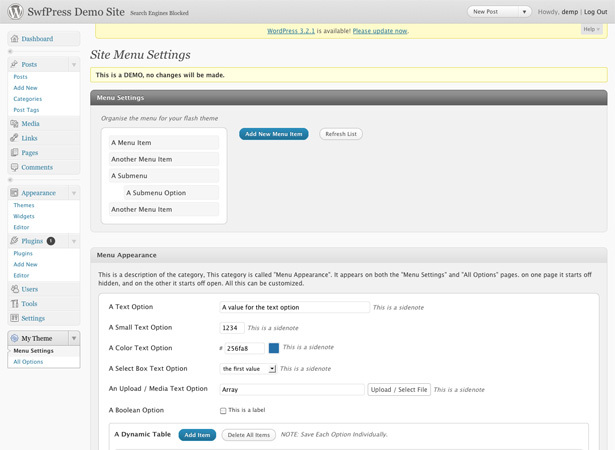 It saves time by offering a basic framework for your theme design, but puts no restrictions on presentation or style. Carrington is actually a suite of starter themes, including a blog theme, a minimalist theme, a mobile theme, a business theme, and a developer theme that’s just a bare-bones theme skeleton. There’s extensive community support for Carrington, as well as professional support available. A number of starter themes to choose from based on your needs. A reactive templating engine is available that makes it easy to create different visual styles for different areas of your sites. 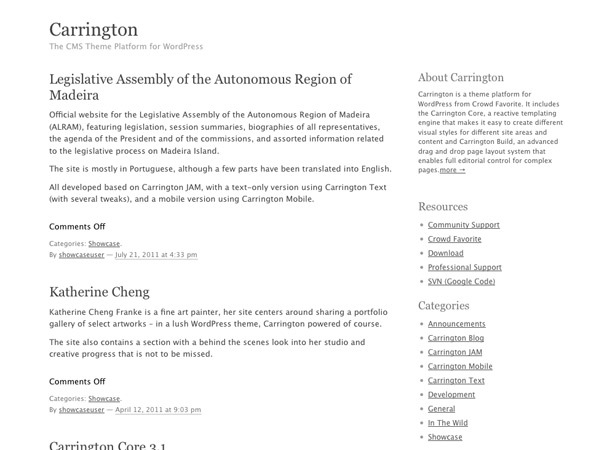 An advanced drag-and-drop page layout system, Carrington Build, is also available. Carrington is growing into a very powerful suite of both premium and free starter theme and framework elements. There’s full documentation available, which makes it easy to get started developing Carrington-based themes. 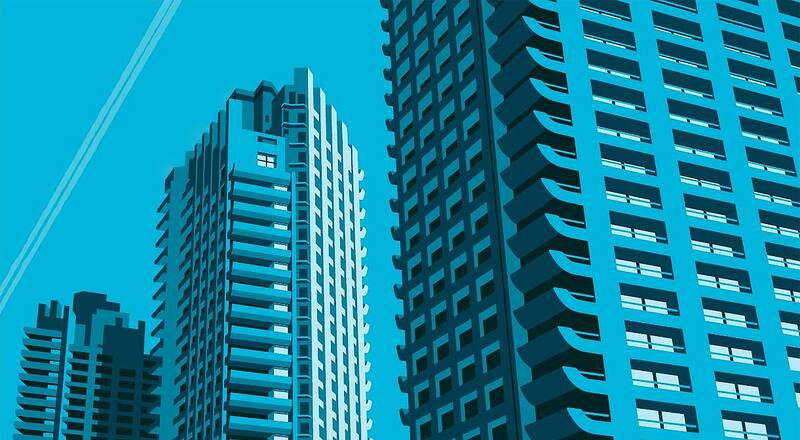 Standard has been used as the basis for countless websites with a huge variety of styles. The premium features built into it make it well worth the price, as does the ongoing support. The layout and style are easy to customize, without any coding necessary. Support for WP 3.1 post formats. A powerful admin panel that includes general settings, framework options, navigation options, ads, comment and sharing options, and much more. Author preferences that includes a sidebar widget and a customizable “Author Box” at the end of each post. Standard is GPL-licensed, so you can use it on all of your sites. 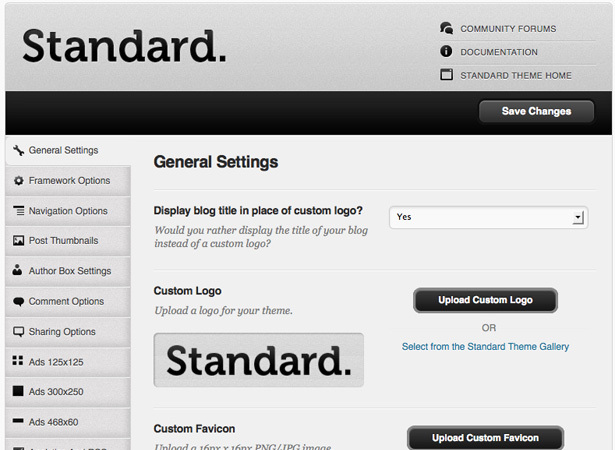 You can build your own themes on top of Standard, or use it on any site you want. This is a great option for theme designers or developers who don’t want to deal with expensive licensing options for publicly released themes or multiple commercial websites. If all you need is a basic, blank HTML5 starter theme, then the HTML5 Reset Theme might be perfect for you. 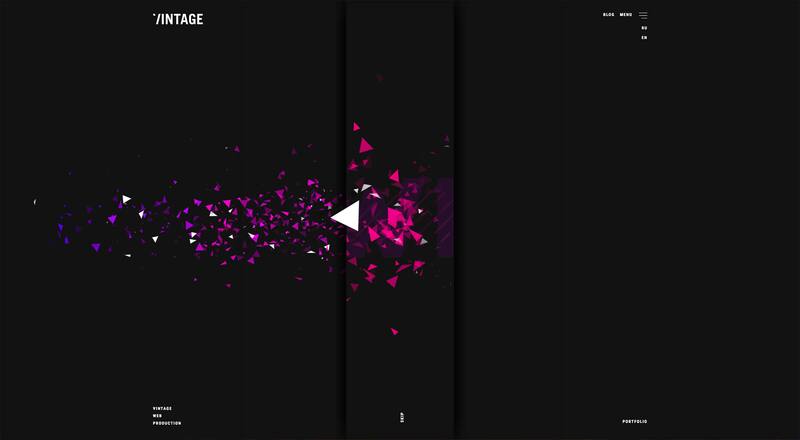 It’s based entirely on the HTML5 Reset templates. jQuery, Modernizr, and Analytics support is built in. Starter CSS declarations for basic WordPress elements. 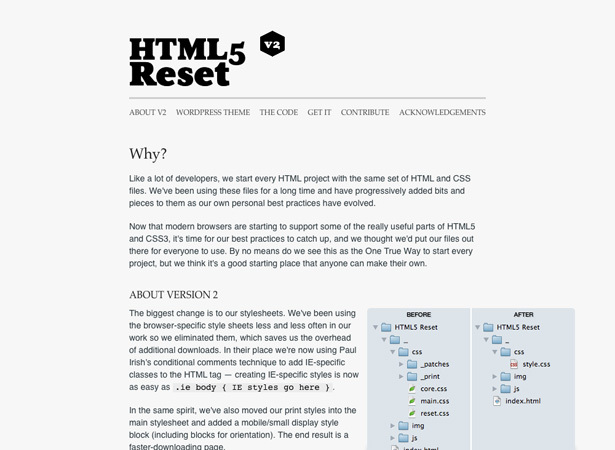 HTML5 Reset is a very basic starting-point for building WordPress themes. It’s obviously aimed at designers and developers who are quite comfortable with code. It’s being developed on Github, and the code is constantly being updated and improved. Buffet is a basic WP theme framework for both end users and developers. It’s built to be redesigned through the use of child themes. It also has support for creating theme extensions by grouping a set of action and filter functions together, making it possible for child theme designers to enable or disable extensions via the options panel. A number of features powered by jQuery. Theme options panel with tabbed organization. Action and filter hooks with inline documentation. Search engine optimization that includes breadcrumbs, headings, and canonical URLs. Buffet is an excellent starting point for the development of child themes. Its minimalist design is also suitable for use right out of the box, a big plus for many developers who want a quick but powerful solution. 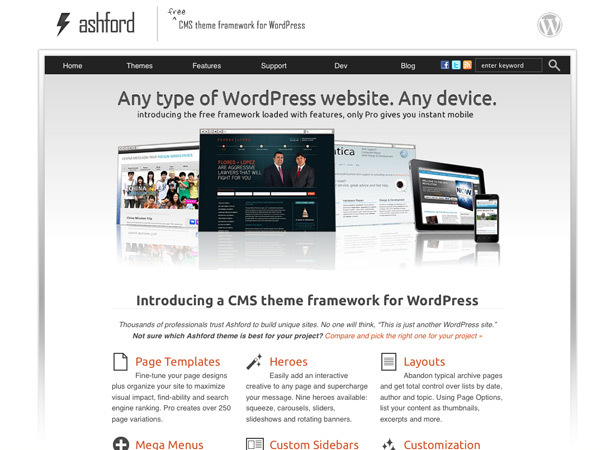 Ashford is specifically a CMS framework for WordPress, rather than a blog framework (or an all-purpose framework). It’s been downloaded more than 20,000 times and has been featured in a number of blog posts since its release in 2008. 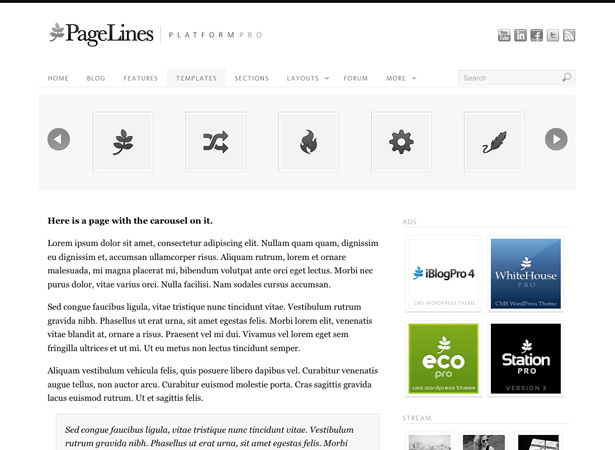 Page templates, including 250 variations in the Pro version. Built-in mega menus in Pro. Interactive hero elements, including sliders, carousels, rotating banners, and more. Complete customization of headers, backgrounds, color styles, and web fonts. Built-in mobile site in the Pro version. Ashford offers a ton of features in both the free and Pro versions. As already stated, it’s meant for non-blog sites, and the features it includes are aimed toward that end. 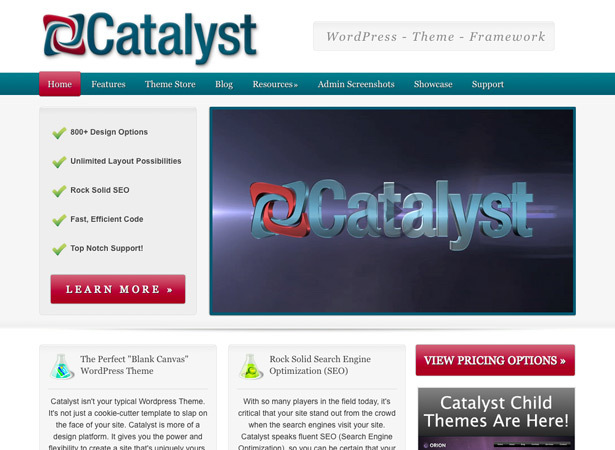 Catalyst is a premium theme framework with tons of built-in features and options. It includes excellent support, unlimited layout possibilities, and more than 800 design options. It’s a blank canvas WP theme that’s flexible and easy to customize. Unlimited custom layouts, widgets, and hook boxes. Dynamik child theme provides 800+ no-coding design options. Built-in child theme creator (with ability to download your child themes). Custom CSS building tool that writes your code for you. Uses HTML5 and CSS3 code. Catalyst has two licensing options available: a personal edition with the ability to use Catalyst on as many sites as you want, but support for only two sites; and a developer addition with support for unlimited sites and access to the developer edition section with exclusive resources. Simon is a framework and blank theme that lets you quickly build and deploy WP websites. It can be built on and used however you please, and has some great features built-in. Built on the 960.gs Grid. Uses the Blueprint Typography Framework. Simon is a great basic framework for creating simple sites. It’s not as comprehensive as some of the frameworks included here, but you don’t always need a platform with a thousand different options. If you need something that’s easy to use and built on a solid platform, then Simon is worth a go. Which WP theme frameworks do you use? Which one is your favorite? Let us know in the comments!